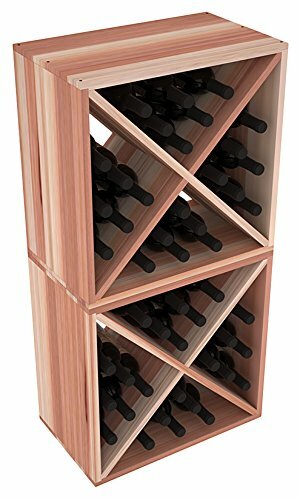 Wine Racks America Redwood 48 Bottle Wine Cube – My Home Wine Bar ! Amazon Price: $284.85 $242.12 You save: $42.73 (15%). (as of February 2, 2019 11:00 am - Details). Product prices and availability are accurate as of the date/time indicated and are subject to change. Any price and availability information displayed on the Amazon site at the time of purchase will apply to the purchase of this product. Two versatile 24 bottle wine cubes. Perfect for nooks, crannies, and converting that “underneath” space into wine storage. Mix and match finishes for a modern wine rack twist. Popular for its quick and easy assembly, this wine rack kit is a perfect storage solution for beginners and experts. With same day free shipping, this value can’t be beat. Also – thirteen other stain finishes to choose from !